Below is all the information we have about Broome Pinniger. As far as we know, the information is correct. However, if you find any errors or have additional information, certificates or pictures, please contact us so that we can update this page. Thank you. Link to Free BMD register page. It is with sincere regret that we record the decease of Mr. Broome Pinniger, the senior partner in the old established firm of Messrs. B. and J.C. Pinniger, solicitors, Newbury, which occurred on Saturday last, Mr. Pinniger, who was in his 73rd year, was a native of Newbury, and had been connected during his lengthened life with the borough- an attachment of which he was always proud and though he could never be induced to take any share in in the administration of civic affairs, he was ever ready to aid local institutions and philanthropic agencies. 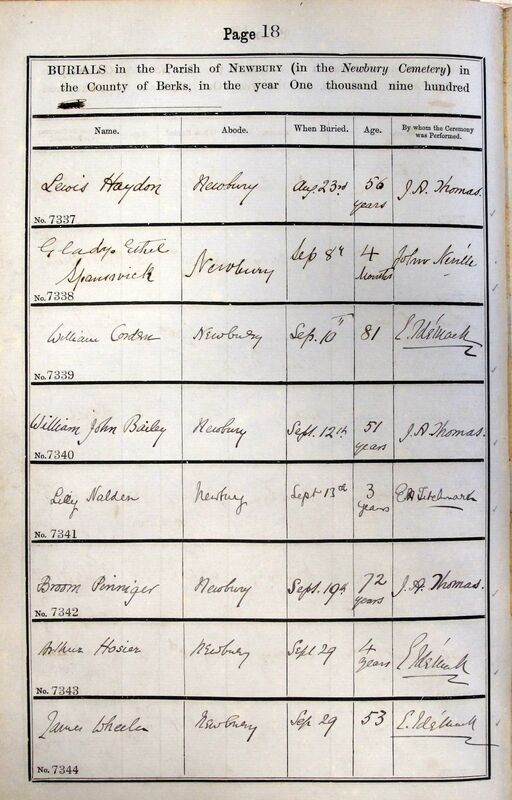 Admitted a solicitor as long ago as 1850, he was associated with his father in his practice some years previous to the death of the latter in 1863. Since then, the practice has been carried on jointly by himself and his brother, Mr. J. Cockburn Pinniger, who survives him. Mr. Broome Pinniger was a Trustee of Kimber's and Cowslade's Charities, a Borough Assessor, and was one of the original members of the Newbury Volunteer Company on its initiation in 1857. He was for a time Lieutenant, and in that capacity attended the review inHyde Parkbefore the Queen and the Prince Consort, and subsequently became Treasurer of the Company. Mr Pinniger was a Freemason but was never prominently identified with the craft. A few years since he suffered from a severe attack of influenza, from the effects of which he never recovered. Though declining in health, he was about as usual until Wednesday last, when he took to his bed, and passed away n Saturday night. He leaves besides the widow, a daughter and two sons, the eldest of whom being qualified as a solicitor, has been associated with his father in his practice. Mr. Pinniger was one of the oldest of our townsmen, having outlived most of those who a quarter of a century ago were leaders in the professional, the commercial, and the social life of the town. To many of the present day methods he was strongly averse. He belonged rather to a period which took life more leisurely and found enjoyment, outside his profession, in the family circle, and in the cultivation of new friendships. His relations with others were always on the ground of strict integrity and dignified courtesy, and his removal will awaken sincere sympathy with those who have thus been bereaved. The grave was lined with moss and flowers. The mourners were Mr. J.C .Pinniger (brother), and Messrs B. Pinniger, and W. Pinniger, (sons), Mr. R.A. Chesterman (brother-in-law), Mr. Wm Wilde (son-in-law) Messrs C.B. Pinniger, H.B. Pinniger, and T.C. Pinniger, (nephews), Dr. Watson, Dr. John Watson. Amongst others present were Messrs S. Knight, J.P. and H. Davis, (churchwardens), W.H. Belcher, J. Mason, F. J. Coldicutt, J.P., W, J, Blacket, James Hiscock, J.W.H. Kemp, &c.
Numerous floral tributes were sent, including the following: Cross, Mrs. B. Pinniger; wreath, B. & W. Pinniger; anchor, W. and G. Wilde; wreath J.C. Pinniger; wreath, Mr. and Mrs. S.V. Pinniger; wreath. Mary, Amy and Edith; wreath, Mrs. H.W. Pinniger and family;wreath, Mrs. C.W. Lea; wreath, Sarah and Mary; cross, Mr. and Mrs. J. Browning. The funeral arrangements were satisfactorily carried out by Mr. H.S. Hanington.